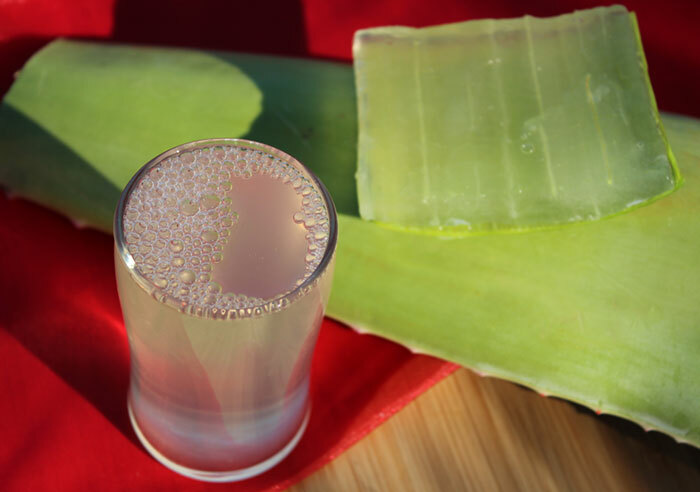 Aloe vera gel and juice, for consumption purposes, is typically extracted from the Aloe barbadensis Miller subspecies of the main "true" Aloe vera plant. This is the most popular variety for dietary use because of its larger sized leaves and medicinal qualities. As a hardy succulent desert-growing plant, aloe has developed a specialized storage structure which enables it to efficiently hold water within its thick green skin. These features provide a moisturizing gelatinous fiber and juice that can have a health enhancing and healing influence when consumed as a dietary food source. Thought to be native to the regions of the Arabian Peninsula, the Aloe vera species of the genus Aloe has been widely utilized throughout human history for both internal and external use. While aloe gel and juice can be preserved and made available as a bottled product, many health enthusiasts are also using the fresh raw leaves directly, adding the filleted inner gel to an assortment of blended drinks. This is, in our opinion, one of the most effective ways to use aloe and take in its complete spectrum of benefits. Large Aloe barbadensis leaves are, in fact, becoming a more common item in produce sections of some natural food markets. Organic selections are also now available from many online suppliers and of course if you happen to live in an environment conductive to its growth cycle, aloe is a great "easy to grow" garden variety that is likewise frequently used as a desert landscape plant. What's the Difference Between Aloe Gel and Juice? When referring to the actual leaf itself, technically speaking the gel is the thick mucilaginous substance in the inner part of the leaf and the juice is the liquid or "sap" that surrounds it. The juice is closer to the green rind of the leaf where more of the bitter aloin content is typically present. The biggest difference is the gel is of a fibrous-type consistency and the juice is more of a dense goopy fluid. 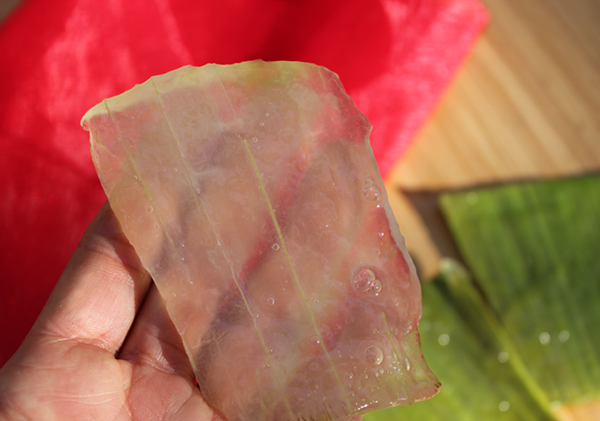 The opaque slightly transparent gel can be easily removed being a solid mass; the juice tends to exude when the leaf is cut. 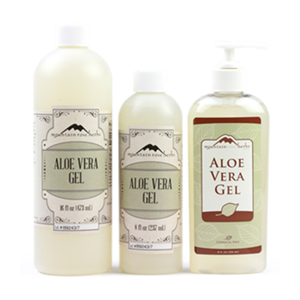 However, when referring to aloe vera gel products versus aloe juice products there are other differences. 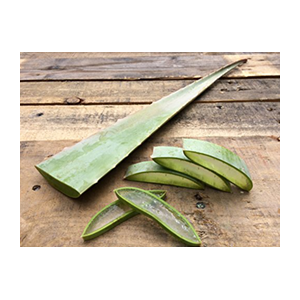 While we highly recommended using fresh aloe and filleting your own gel, there are several organic quality products available for greater convenience. These are created from straight organic aloe with a very small percentage of other ingredients added. The thing with aloe is that the instant it is cut and the gel is removed, it quickly starts to degrade in nutritional value, color and texture. This is evident when you keep freshly filleted aloe gel at room temperature or even refrigerated. It will soon darken and lose its viscosity over a few days' time. For this reason, when producing bottled varieties, there are also other ingredients besides aloe utilized by product manufacturers that act as both preservatives and thickening agents. In gel products, created from the inner fillet, many brands also add small amounts of carrageenan to provide greater thickness. Ingredients like citric acid, sodium benzoate and/or potassium sorbate are also utilized to stabilize pH and inhibit mold growth. In addition, sometimes other company-specific proprietary processing techniques are employed to concentrate polysaccharide content. 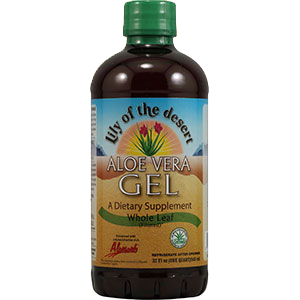 This produces substances like the Aloesorb ingredient used in Lily of the Desert Aloe Gel. While most higher-quality manufacturers we contacted claimed that their carrageenan was derived from irish moss, this doesn't really mean that it isn't "carrageenan extract" which in our opinion is very different. Some individuals who are particularly sensitive to even small amounts of carrageenan may therefore wish to avoid using bottled aloe gel. Aloe juice products, however, are void of carrageenan because they are in liquid form and don't require a thickening medium. What is Whole Leaf Aloe Juice? When a product is labeled "whole leaf aloe juice", this means that the trimmed washed whole leaf (often including green rind) is first juiced and then filtered using different methods depending on the company. These types of bottled aloe juices therefore contain the "gel", even though they are a liquid variety. What is Aloin and Can it Be Toxic? 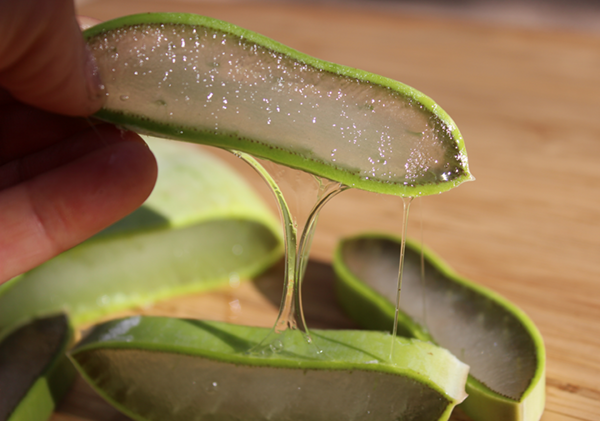 Aloin, also called "aloe latex", is a bitter yellow-brown colored compound located just underneath the rind or skin of the leaf. 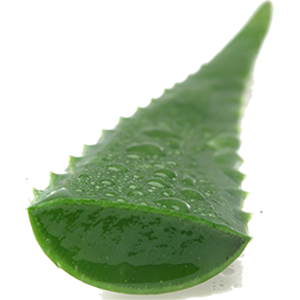 When you fillet an aloe leaf, this bitter taste is apparent on one's fingers after touching it. In small amounts, aloin can have a therapeutic quality, being an anthraquinone, and is most well-known for its properties as a natural laxative. But when repeatedly used in large amounts, it has been shown to be an intestinal irritant which can have toxic side-effects. Most aloe manufacturers are up-to-date on aloin safety and usually contain less than 1 part per million of aloin. In addition, some suppliers are also certified for content and purity by the International Aloe Science Council. 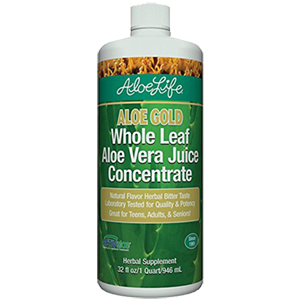 Other brands, like Aloe Life, make a concentrated juice product called Aloe Gold containing greater amounts of bitter aloin, which may be beneficial depending on your current health goals and frequency of use. We believe some aloin content can be favorable, as long as you don't over consume it for long periods of time. Many health authorities consider a properly functioning digestive tract, free from obstructions, to be the key foundation for optimal health and wellness. 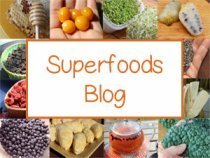 After all, this is the system that breaks down the nutrients and life-force from the food we consume and provides energizing nutrition to the entire body. 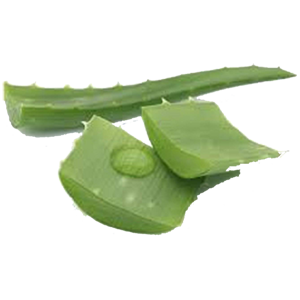 Aloe vera gel, which is made up of concentrated long-chain polysaccharides, is a potent source of soluble dietary fiber and can be very useful for constipated conditions as a natural plant-based laxative. Unlike other herbal laxatives or over-the-counter medications, it is known for its mild and soothing qualities that help to encourage good stool formation, promote regular bowel activity and ease defecation. As a potent source of dietary fiber, aloe is also naturally a top recommended dietary superfood, along with chia and flax, for most weight loss regimens and can be added to blended cleansing beverages or green juices. Aloe juice products, like Aloe Life's Aloe Gold, which are more concentrated in anthraquiones such as emodin and aloin, are more cathartic or purgative in nature. This is also true for freshly filleted unrinsed gels, which will contain some of these bitter substances helpful for stimulating digestive juices and increasing intestinal peristalsis. Dietary supplementation with aloe can help to alleviate indigestion, bloating and flatulence and can likewise be a nourishing food source and anti-inflammatory aid for those with colitis (*), ulcers, acid reflux, diverticulitis and IBS. (*) Remember, however, that it is important to seek the advice of a qualified medical practitioner before using aloe to treat such conditions. There is notably, in our opinion, a more complete range of polysaccharides in fresh aloe vera gel than commercially bottled brands, which could be of particular importance depending on your current health objectives. Also, keep in mind, that more enzymes are also found in raw aloe rather than flash pasteurized products, which is a legally required procedure. Aloe is also naturally alkalizing to body pH and can be of benefit to overly acidic conditions that can help to encourage an overgrowth of unfriendly gut bacteria. A healthy intestinal tract is intimately connected with the health of the immune system via a mass of tissue that make immune cells, called the "gut-associated lymphoid tissue." Anthraquinone compounds in the leaves additionally act as antibacterial and antifungal agents to help prevent conditions like systemic candida infections. 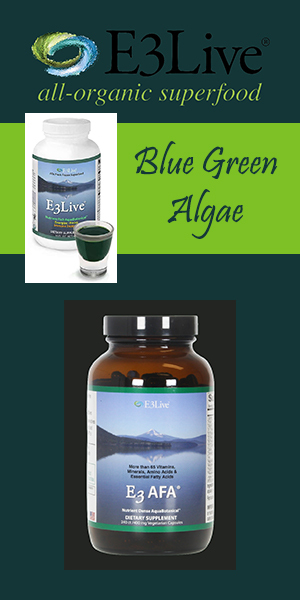 Likewise, the gel's polysaccharide constituents serve as a prebiotic to friendly microflora and help to nourish the protective mucous membranes lining the digestive tract. 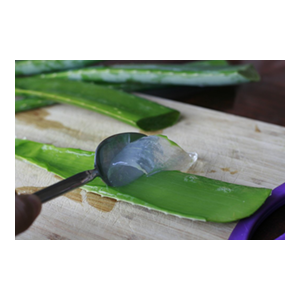 The mucilaginous gel from the Aloe barbadensis species varies from between 98.5% to 99.5% water content and thus is very hydrating to the body as well as lubricating to the skin and hair, even when consumed internally. It is known to assist in the detoxification process, providing cleansing effects that are helpful for removing excess waste material and eliminating toxins. 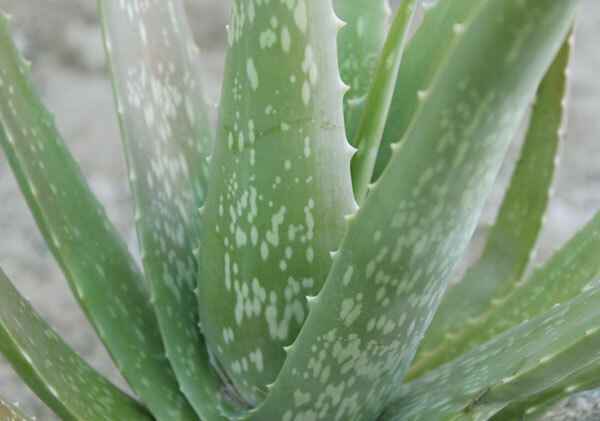 Aloe's cleansing actions, especially when the more bitter anthraquinones are present, also intrinsically help to clear up external skin issues, like acne, eczema and sometimes psoriasis. 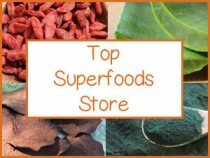 It is a number one ingredient to use with activated charcoal and lemon in detox drinks like charcoal lemonade. In Ayurveda, it is considered very good for pacifying Pitta or heat related conditions and also likewise helps to clear "ama" or toxic build up in the body. One of aloe's beneficial nutrients includes sulfur-based MSM which can additionally help to support healthy strong joints. The polysaccharide content found in aloe vera gel is also potentially nutritive for increasing joint flexibility and relieving pain. It is important when purchasing aloe products for dietary use to make sure they are not for external use only as these varieties might contain other non-edible ingredients aside from aloe. Lily of the Valley - Established in 1971, this is the most popular quality organic brand found in most health food stores across the U.S. It is grown and processed in Texas and Mexico. Their juice contains the inner fillet, Aloesorb, citric acid, potassium sorbate. They also have a preservative-free juice product that contains only aloe, Aloesorb and citric acid. Their gel product is made from the inner fillet, Aloesorb, plus carrageenan (thickening agent), citric acid and potassium sorbate. 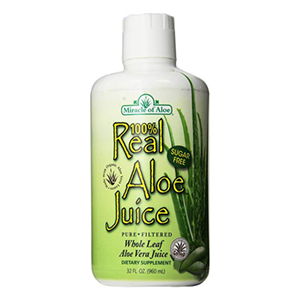 Real Aloe Inc - Established in 1972 and organically grown in Southern California. 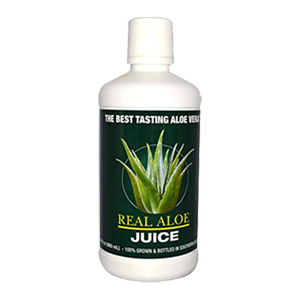 Their aloe juice contains aloe plus proprietary processed water, less than 0.5 percent citric acid, potassium sorbate. 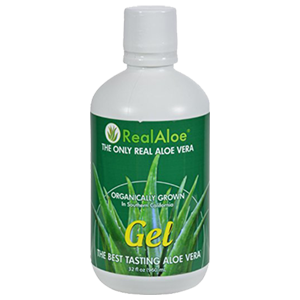 Their aloe vera gel contains aloe fillet plus proprietary processed water, carrageenan (irish moss), less than 0.5 percent of citric acid. Aloe Life - Established in 1991, offers a Aloe Gold whole leaf juice that is extracted with a biological certified process called ActivAloe. It has a dark yellow color it is not over filtered, overheated or diluted, according to their website. Their aloe is grown in Texas and New Mexico. 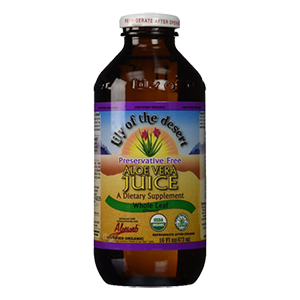 Miracle of Aloe - Established in 1981, offer an organic whole leaf aloe juice product for internal use and contains aloe, citric acid and potassium sorbate. 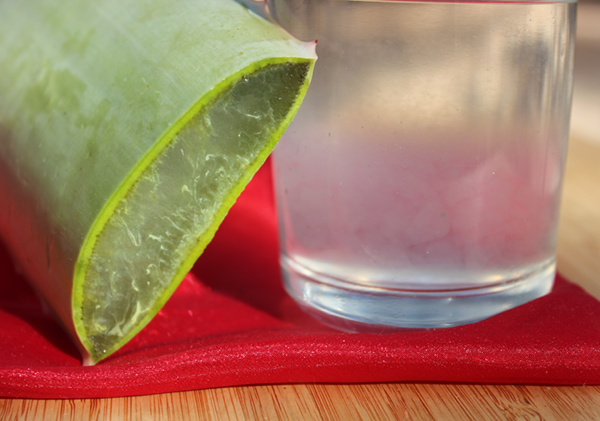 Freshly filleted aloe vera gel can be blended into smoothies, shakes or most any beverage. It will add a thick emulsifying quality and camouflages well with other ingredients. 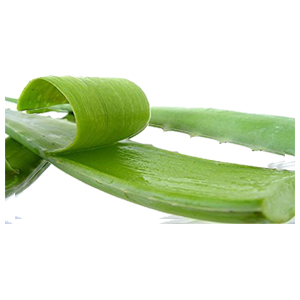 Whole organic Aloe barbadensis leaves are available by the pound from several online suppliers or you can grow your own if you happen to live in a region conductive to its growth. Whole aloe leaves once cut can be stored in the fridge for several weeks. Bottled aloe vera gel or juice can also be utilized in drinks, juices or mixed into water. It is important to make sure that you get aloe sold as a dietary or herbal supplement not products intended strictly for topical application. Excessive internal use may cause abdominal cramping and loose stools. It is often best to avoid consuming aloe vera gel when pregnant. Consult your physician or health care provider before using aloe if you are pregnant, nursing, have a serious medical condition or are taking prescription medications.